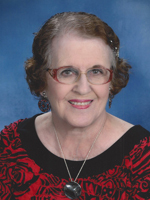 Marie “Toni” Antoinette Criner, 81, passed away on Sunday, April 7, 2019 at Mary Immaculate Hospital. She was born in Pheonix, AZ and had made her home in Newport News since 1965. She enlisted in the U.S. Navy in 1956 where she met and married her husband, Richard Criner in London, England. She owned and operated Criner Realty with her husband. She was a dedicated member of St. Jerome Catholic Church and enjoyed socializing with the Red Hat Society. Toni was preceded in death by her husband of 44 years, Richard Criner. She is survived by her sons, Eric Criner (Kiomara) of St. Petersburg, FL and Mark Criner (Deborah) of Radcliffe, KY; her daughter, Karen Savarese (Stanley) of Melbourne, FL and 6 grandchildren. A Memorial Mass will be held at 11:00a.m.on Wednesday April, 17, 2019 at St. Jerome Catholic Church by Rev. Patrick Baffour-Akoto. The family will receive friends following the service at the church. In lieu of flowers, donations may be made to The Knights of Columbus, Walter Pollard Council #5480. Arrangements by Weymouth Funeral Home.